In this 3-part mini-series, we’re going to discuss X-Ray vs. MRI imaging. In Part 1 we’ll briefly talk about how each of these modalities works and whether or not they emit harmful radiation. In Part 2 we’ll look at which one is the better choice for analyzing your posture, and finally in Part 3 we’ll look at some real examples of neck and low back X-Rays and MRIs and compare the two. Part 1 – How do they work? 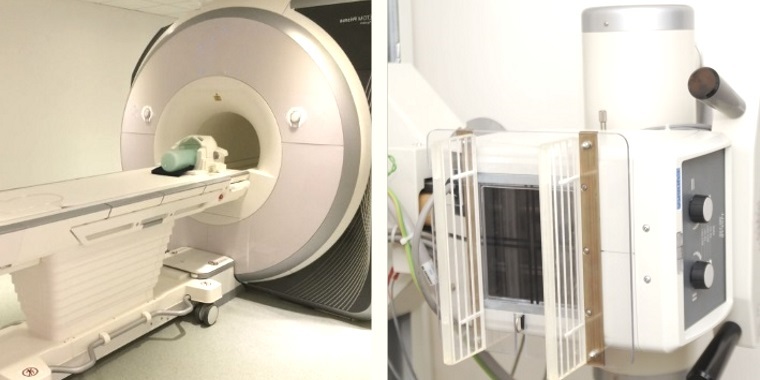 Lets start with MRI – Magnetic Resonance Imaging. An MRI machine is really just a gigantic magnetic that provides 3D images – it’s like been placed in the middle of a massive donut. You don’t really need to know how it works, but I happen to think it’s fascinating. So humans are made of water and water is made of hydrogen and oxygen. Hydrogen has a positive charge because if you recall from highschool chemistry, it has one proton. When the body is placed in a strong magnetic field, such as an MRI scanner, the protons in each hydrogen atom line up along the same axis. When the magnetic field is then turned off after say 20 minutes, the protons flip back again and this causes a signal; and this signal is used to create the image. Because an MRI uses magnets, or magnetic radiation, it isn’t considered harmful to your body. X-Rays work differently; they also use energy but not from a magnet. The beam of energy from an x-ray, comes into contact with your body, and is absorbed in different amounts by different tissues, depending on the tissue density. 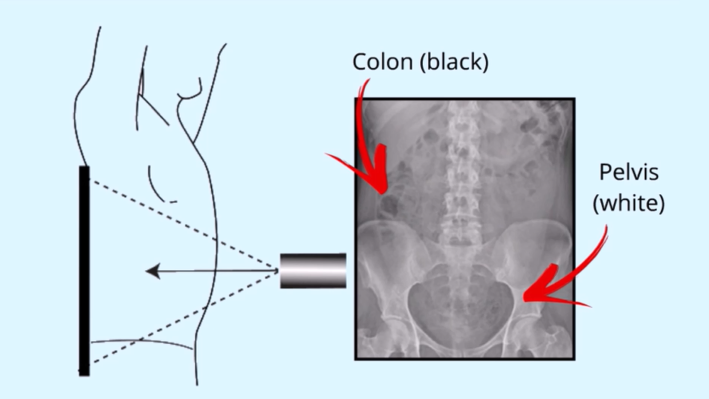 An x-ray beam passes straight through softer tissues and looks black on film, but gets absorbed by denser materials like bone and these structures look white on film. Xray imaging is ionizing radiation. In other words it delivers much more energy into the body than an MRI. This high frequency energy causes atoms or molecules to gain or lose electrons. This can damage a cell. Damaged cells divide and create more damaged cells. That’s why we don’t x-ray pregnant women; because there is a lot of cell division happening there. Before we freak out about having an x-ray. Let’s put this into perspective. There are many items we use daily that emit low dose radiation. Sunlight, cell phones, tablets, computers, wifi routers, microwaves, cigarettes, television and fertilizers. It’s the cumulative effect of yearly radiation that’s important here. 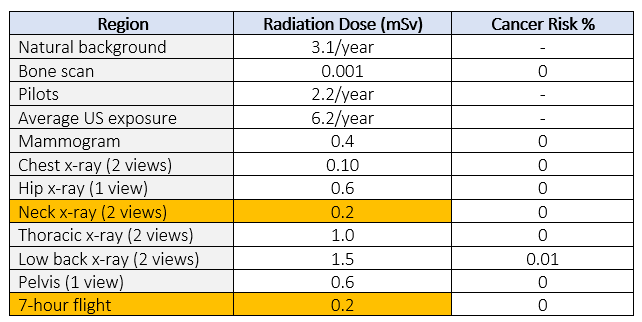 In Canada, the Nuclear Safety Commission sets a limit of 50 mSv of maximum allowable radiation in a single year and 100 mSv over 5 years; or an average of 20 msv per year. Perspective is what’s important here. The benefit from having a structural diagnosis of your neck (0.2 mSv) provided by x-ray far outweights the risk of radiation harm. In fact, one seven-hour flight will give you the equivalent radiation dose of two neck x-rays, according to the x-ray risk calculator. The only reliable means for analysing the bony structure of your spine, is x-ray. Your healthcare practitioner can not, under any circumstance, diagnose your structural problems with only a physical examination; regardless how skilled there are! It is therefore crucial to have an x-ray before the start of treatment and/or exercise programs begin. We will discuss this in much detail in Part 2 of this mini-series on X-Ray and MRI.